Virat Kohli is a popular Indian cricketer who is known for his batting abilities. He is currently the Captain of Indian Test cricket team and Vice captain in One Day Internationals. Here's a full story of Virat Kohli's Biography Wiki and his life history as a cricketer and read this biography in PDF (Hindi / Tamil / Bengali). As an able leader, Kohli has broken many records in International cricket owning to his strike play and his form. We have given his comprehensive family background details too which he comprehends more than anything. Achievements of Virat Kohli has surpassed numerous records as he was part of India U-19 World Cup win in 2008, part of winning squad in WC 2011 and Champions Trophy 2013. Virat Kohli was the mainstream during India's successful win in WC (U-19) in Malaysia. The win turned Kohli's life altogether as he was recognized to be the most talented cricketer in his young age. In that tournament, Kohli scored 235 runs in 6 matches averaged at 47. His impeccable decisions and match winning performances gave India U-19 the edge to win the tournament. After the win, he got another chance to prove himself on International level when India A toured Australia in Emerging Tournament 2009. Kohli stood out and became the highest run-getter of the tour. His performance again made limelight as India went on to win the tournament with absolute brilliance. After following a superb batting performances in U-19 level for India, he got his first opportunity in 2008 against Sri Lanka. He scored 12 in his first ODI match. In the later matches, he contributed equally well that helped India seal victories against home team Sri Lanka. His crucial batting performances are well remembered for India's first series win against Sri Lanka in Sri Lanka. Later in 2009, he got another chance to prove his worth in Champions Trophy. India played Sri Lanka in home during December'09 when Kohli played some superb knocks to help India win the series under the captaincy of M.S.Dhoni. In 2010, Kohli was announced for the first time to play the entire tri-nation series in Bangladesh. He scored two magnificent hundreds to seal India's victory in both games. However India was unable to clinch victory in the tournament. Again in the same year, Kohli was announced as vice captain for upcoming tour in Zimbabwe. India went on to lose the tri-nation series once again, but Kohli stood as fastest Indian to score 1000 runs in International cricket in 2010 calendar year. He also made his first T20 debut that year against Zimbabwe and played a stunning knock that helped India win the match and also seal series win. Virat Kohli's batting performance was awarded with his place in national side for World Cup 2011 under M.S.Dhoni. He was appointed as a middle order batsman for India in 15 member squad. He scored his first World Cup hundred in his very first match against Bangladesh as India went on to win the match. His crucial runs in an important partnership with Yuvraj Singh against West Indies gave India the much needed chance to qualify for knock-out stages. His third important knock came against Sri Lanka in World Cup final, when he stood strong with Gautam Gambhir to hold India's nerves for third wicket stand. India went on to win the World Cup in Mumbai, 2011. Kohli ended his WC campaign with 282 runs in 9 innings at an average of 36. Kohli's form was given another chance when India toured West Indies after the World Cup as he was chosen in the Test side for the first time. He was surfaced with difficulties and his approach in Test cricket was questioned for the first time. It was one of the forgettable series for him. He was chosen to India's test and ODI squad to England after Yuvraj Singh was reported injured and was dropped out. Kohli's stand out form as middle order batsman came into spotlight when he scored a century against England in the ODI's. He finished the ODI series with the second highest run-getter, but still India went on to lose the away series. England toured India in 2011 for ODI series in which Kohli again stood out to help India regain 5-0 whitewash against England on home soil and being awarded the highest run scorer again in that series. Kohli was announced in the four match Test series against Australia in which he scored a hundred in the fourth and the final test. His hundred remained the only century by any batsman from that disastrous test tour. India was white-washed 4-0 under the leadership of M.S.Dhoni. Kohli remained once again the top scorer of that test series with a hundred. His brilliance in batting gave him a limelight in CB Series 2012 against Australia and Sri Lanka. His remarkable knock of 133 not out off 86 balls against Sri Lanka was announced to be the ODI Innings of the Year 2012. His hundred remained the sole century from Indian side in that ODI series too. He aggregated 373 runs at an average of 52 as he finished with the top scorer in CB Series. India lost in their chance to defend 2012 Commonwealth Bank series. 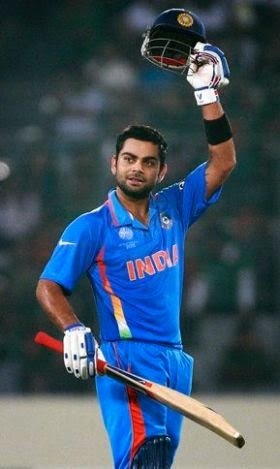 Coming in Asia Cup with extreme pressure, Team India announced Virat Kohli as vice-captain for ODI's. Kohli scored hundreds against Sri Lanka and Pakistan. He scored 67 against Bangladesh too. His knock of 183 against Pakistan was once again rewarded as the best innings ever played by an Indian against Pakistan. His score of 183 is the highest by any batsman against Pakistan. Unfortunately India couldn't qualify for the final despite winning two out of three matches. India toured Sri Lanka for 5 match ODI series in August 2012. Kohli was once again instrumental in bringing steadiness in batting order as he scored three hundreds in that bilateral series. India won the series 4-1 in Sri Lanka as Kohli was announced Player of the Series award. He was selected in the Champions Trophy 15 member team led by M.S.Dhoni. He played a valuable knock of 38 against England in the Champions Trophy Final match. His score helped India gain a respectable total to defend in the final. India went on to win the trophy. Kohli was announced the captain for first few matches of triangular series in West Indies with Sri Lanka. He scored two hundreds in a gap of 4 matches that led India reach the final of the tri-series. Later India went on to win the series under M.S.Dhoni as captain. Zimbabwe Tour gave Kohli a chance to prove his captaincy skills as he was named the captain of the side. He scored a hundred in that tour and made India clinch an unassailable 5-0 whitewash outside home. Virat Kohli was in prime form and in the peak of his life both in terms of rankings and batting abilities. This was the first time when he outplayed the Aussies that toured India for a bilateral ODI series. He scored two hundreds in that series, one coming in 52 balls that remains the fastest scored by any Indian till date. India won the series 3-2 under extreme batting capabilities of Kohli and other senior batsman. By the end of the series, Kohli was announced in No.1 spot for ODI rankings for the very first time in his life. At this point of time, Kohli was regarded to be the best batsman in the world in ODI chases done successfully. M.S.Dhoni's absence led Virat Kohli take over the captaincy in Asia Cup tournament in Bangladesh. He scored a hundred against Bangladesh in the very first match. However the team lost it's way and went on to lose two matches thereafter, thereby losing their spot from the finals. At the end, Kohli's captaincy was suddenly questioned because of his inexperienced team leading qualities. Kohli's T20 form was instrumental in bringing India to the verge of winning the title for the second time in T20 World Cup. He scored back to back three fifties in the important super eight games and league matches. In the final against Sri Lanka, Kohli scored an unbeaten 76 run knock that fetched him the highest run getter in that tournament. However India lost the final to Sri Lanka. He was awarded as the Player of the Tournament for being scoring four consecutive fifties in a row. At that point of time, Kohli attained the No.1 spot in Batsman's list for T20 rankings. Virat Kohli headed for a dreadful time in England when he was constantly caught at the slips off James Anderson. The test series brought many speculations of the player and doubts over his skills of approaching test cricket. He averaged 13 in the entire test tour of 5 matches that eventually India lost 2-1. In the ODI's, Kohli scored a half century that brought some relief for him in the disastrous tour that ended with India's win in ODI's with 3-1 lead. 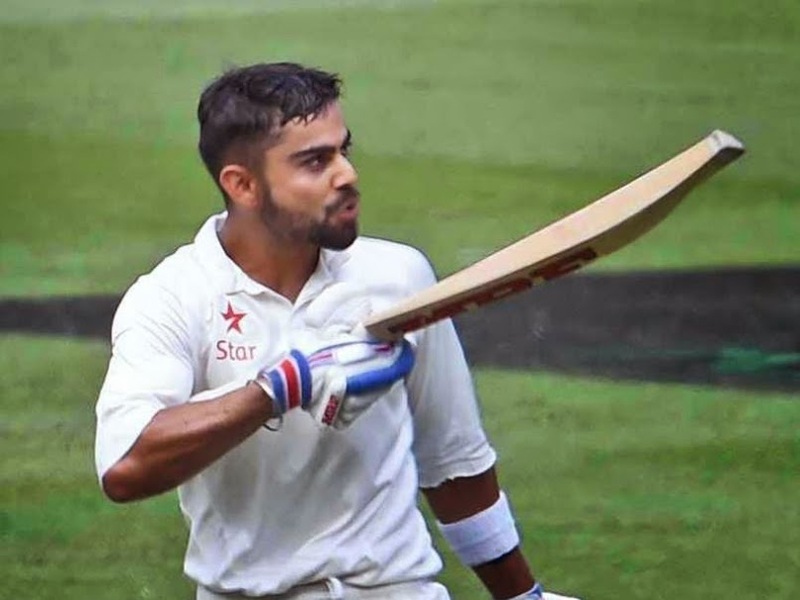 Virat Kohli was highly discussed when he was named as Test captain for first test against Australia in Melbourne. Kohli scored his two hundreds back to back in both innings that almost took India to the verge of victory against Australia. In Adelaide, he against scored a century proving his skills and mentality equally well and answering all critics against him. After the third test, Kohli was named captain for the final test after Dhoni announced his sudden retirement from test. In Sydney, he scored his fourth hundred giving India a respectable score in first innings. He aggregated 692 runs at an average of 86 second highest after Steven Smith in that test series. Nobody expected this so earlier that there would be a biography about the cricker Virat Kohli. It is true that he is legend but he is still playing, so I expected it bit later. explore more to know about the quality of writing.